What, may you ask, is there to celebrate? Well, a number of things, really. With these cupcakes we are celebrating life, love, new socks, sunny Mondays, and freshly scrubbed bathroom surfaces. But, most importantly, today we are celebrating the most deliciously wonderful parents — mine, as it were — and their 31st wedding anniversary. Happy anniversary, parents! Personally, I’m glad you got married. I’m glad you’re glad you got married. If you hadn’t, I might not exist, and then who’d bug you with phone calls at all hours and only sometimes grammatically correct emails? Dad, who would roll their eyes at your jokes and call you Dadman and pretend not to hear you when you ask if anyone wants to go throw the ball around? And mom, who would follow you around the house and teach you about leggings and slowly turn into you as she gets older? Thank goodness you guys went through with it. Mom, good choice with Dad. That guy is weird, but he makes a great meatloaf. And Dad, good choice with Mom. She’s a nut, but have you seen her tennis forehand? In truth, Mom, Dad — your marriage is the one by which I judge all others, a happy example of respect, partnership, love and straight-up fun. I only hope I get half as lucky. Happy anniversary! Have a cupcake. The batter for these chocolate cupcakes gets mixed together, a bit willy nilly, in one large bowl, which means less fuss and fewer dishes. Once baked, their texture is extremely Light (capital L) and Fluffly (capital F), ethereal even, so don’t expect a terribly hearty and substantial cupcake, at least as far as texture is concerned. Flavor-wise, these pack a deep chocolatey punch, helped along by a bit of espresso powder. These are Good. Capital G.
In a large bowl, whisk together the dry ingredients (from flour through espresso powder). Add canola oil and sour cream, and stir with a rubber spatula to blend. Gradually mix in the water, using a whisk as the batter becomes looser (it will look very liquidy – it’s okay). Add the vinegar and vanilla, and whisk in the eggs. Beat the batter until very well blended. Divide the batter between cupcake pans, and bake until well-risen and a toothpick inserted into the middle of a cupcake comes out clean, about 20-30 minutes. Cool completely – as soon as they’re cool enough to handle, remove cupcakes from the pan and place them on a wire rack to finish cooling. 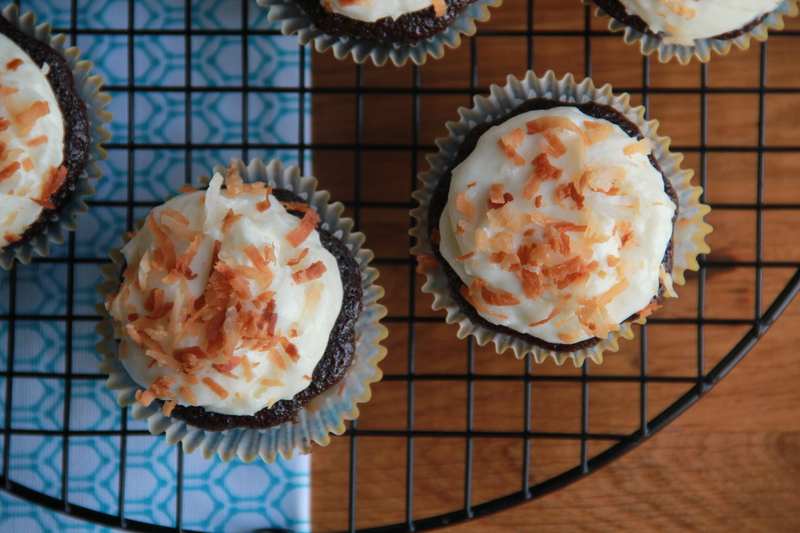 While the cupcakes cool, spread 1 cup shredded coconut on a sheet pan and place in the hot oven to toast. Remove coconut once it’s turned golden brown, about 5-10 minutes; check on it often, it burns easily. To make the frosting, combine the cream cheese and butter in the bowl of a stand mixer fitted with the paddle attachment. Beat them together until well combined and fluffy. Add the confectioner’s sugar and slowly beat to combine. Add the two extracts and the remaining cup of shredded coconut and stir to fully incorporate. 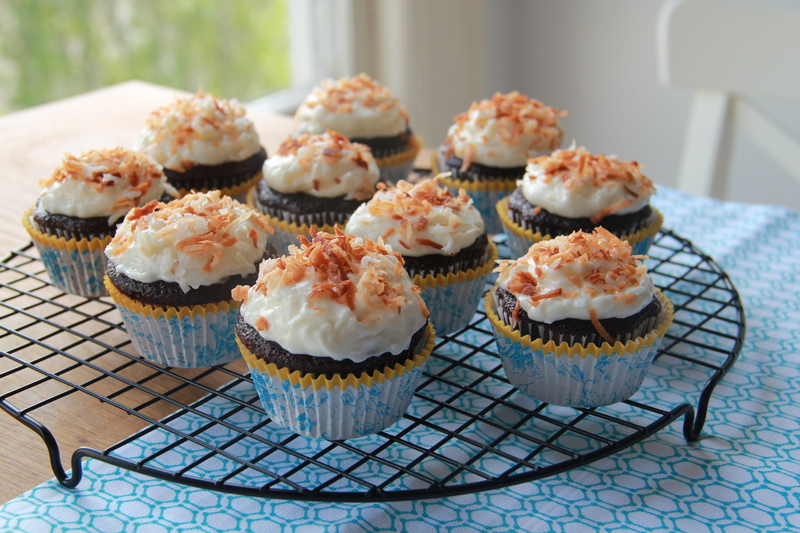 Once cakes are completely cool, spread frosting on each one (this frosting is difficult to pipe due to the inclusion of the shredded coconut – I find spreading to be easiest and look nicest). 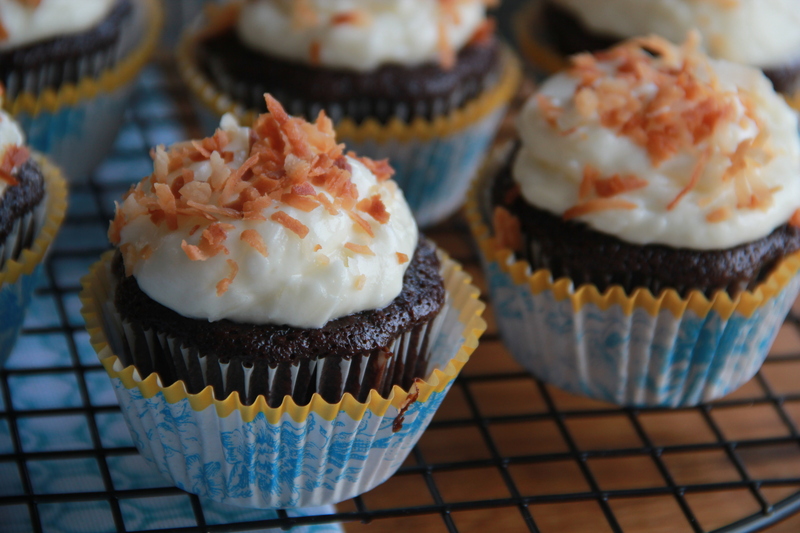 Sprinkle some toasted coconut shreds on each cake to decorate. Cupcakes will keep, unfrosted and frozen, about 2 months. Frosted cupcakes will keep for about 3-4 days in an airtight container in the refrigerator. cupcakes look amazing, chef molly! 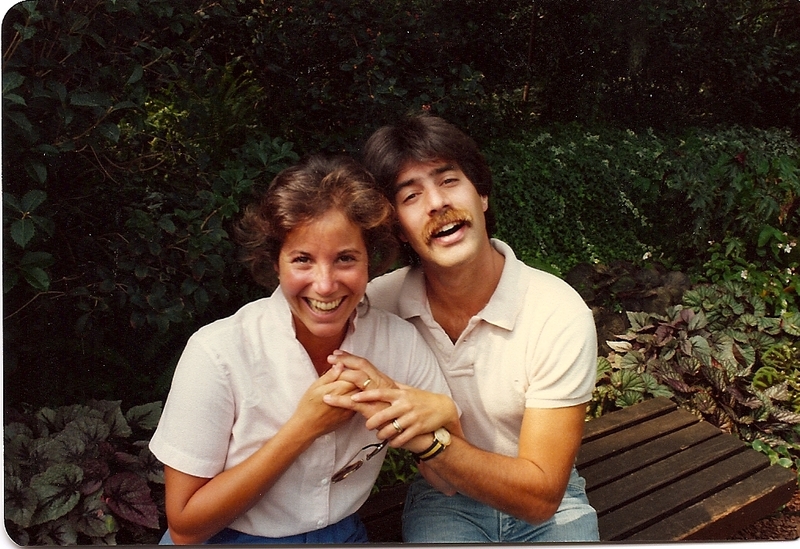 But you are right — more amazing is your two wonderful parents — happy anniversary andi and bruce! love you lots. been through it all with your Mom & Dad and it was definitely worth it all!! especially, when one of the best outcomes of that special union is YOU!! Love you, my Molls!! Oh, these look amazing! Chocolate + coconut??? A match made in heaven 🙂 Thanks for sharing the recipe…can’t wait to try it!